Here's another error from the late 1980s that's very easy to miss. Or maybe you're a die hard Welch collector/fan that lives in the greater Oakland area and have a pile of these stocked away for future use. Even if that is the case, it's highly unlikely that's the typical scenario. 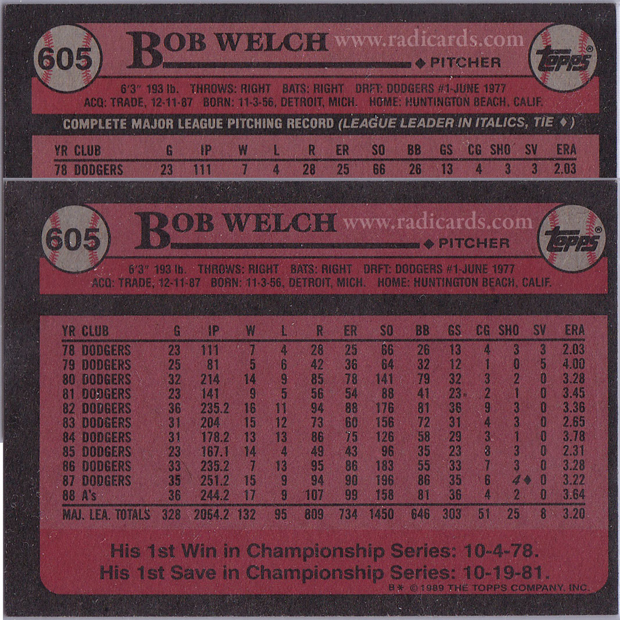 That said, let's shed some light on the Bob Welch 1989 Topps #605A . Take a closer look at the backs of the COR and ERR version above. You'll notice that the card in front is missing the print where it's supposed to say "Complete Major League Pitching Record". This little misprint drives this error card to be worth more than 200x that of its corrected counterpart shown above in the back. Keep an eye out for this bugger. If you collected in the late 1980s, it's perhaps the case that you're sitting on tons of 1989 Topps that nobody wants. You might take a few moments to rummage through that mess and see if you have this card. If not, they sell for a few bucks on the secondary market. Also, if you like this read, you may enjoy my discussion on another Bob Welch.